If you could search your friends’ thoughts, interests, and activities, would that be a better search experience? In many cases, it would be. Searching for restaurants, books, or movies, would turn up recommendations from people you actually know. If you are researching a trip to Florence, Italy, you might discover ten friends who have been there already, and could ask for advice on what to do. These scenarios have been the dream of social search for a few years, with both startups and search engines taking a stab at it. But so far it’s been a failed dream. Yahoo’s experiment with social search, Yahoo 360 MyWeb, never took off. is being shut down. It was a rudimentary social search in that relevant bookmarks from friends showed up as search results. And search has never been Facebook’s strong suit. It handed search over to Microsoft, but the search experience on the site is poor. It is difficult to search much deeper than your friends’ names. You need to go to an advanced profile search page to filter through their interests, activities, or other profile categories, for instance. And forget about searching your news feed. 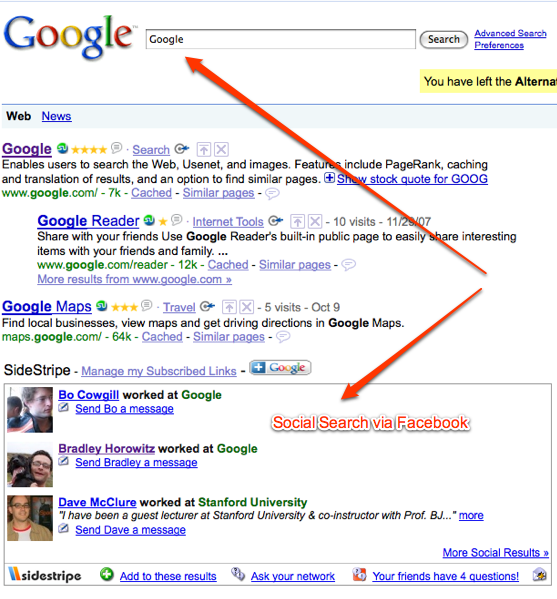 Yet social search done right could become very valuable for Facebook . And it would be even more valuable for Google. (They already know how to make money from search). It is also an opportunity for Microsoft Live Search, but they are not really inspiring much confidence so far. So let’s set aside for a moment the unlikelihood of any Google -Facebook deal or partnership (given Microsoft’s investment in Facebook), and let’s imagine how the two could help each other. A search for “biking” turns up friends who are interested in biking. You can also add your own knowledge to any search result, and it will appear as a subsequent result (although it does not let you add links, which I consider a major bug). Or if you still can’t find what you are looking for from either Google or Sidestripe, you can ask all of your friends a question from inside the Sidestripe box on Google about the topic you are trying to learn about and that question shows up in all of your friends’ feeds. Any answers then become indexed and searchable. Sidestripe is barely out of alpha and still frustrating to use because more often than not the Sidestripe box remains empty. When there are results, they are interesting. It is hit or miss. As more people use Sidestripe, this should improve. But I think a big part of the problem is that it does not fully index my social graph, and certainly does not return results from my News feed. Yet making Facebook’s News feed searchable (on Google) would go a long way towards realizing the dream of social search. The Facebook feed already aggregates what my friends are doing not just on Facebook but all across the Web (Twitter, Flickr, YouTube, Digg, etc.). It’s like Friendfeed in this respect, but with many more users. The trick to making all of this seemingly random data useful in search is to come up with a social algorithm that can rank it all accordingly. For instance, when I search for Florence, Italy, friends who have lived in Florence, Italy should show up, but so should friends who have recently taken pictures there or Tweeted about Florence, and maybe in that order. This kind of ranking is a hard problem to solve, and it is what Google is good at. Imagine instead of Sidestripe, the option to add Facebook Connect to Google search, which would then turn on social search in results (these should only appear when there actually are social results to show). They could keep the Q&A capability in there as well. It would add an entirely new dimension to search. Of course, Google has its own Friend Connect program, and wants to monetize it with <a href="Friendsense. But just as search is not Facebook’s strong suit, social networking isn’t Google’s. All my contacts are on Facebook. They are the ones I want to search. And everything I’ve described above is a big opportunity for Microsoft, if they can pull it off. But the best results, IMHO, would come form a combination of Facebook and Google.